The Central Highlands of Vietnam are an unspoiled beauty that not many people have explored. Along the journey, you will go through different landscapes from big cities to waterfalls in the mountains. You will experience the temperature swings, switching from cold to hot in an unexpected way. But what makes this trip truly special is that you will travel through the legendary Ho Chi Minh trail. Last summer, I had the trip of a lifetime traveling along Vietnam by motorbike with my boyfriend. It was the quickest decision I have made in my life. If I could publish this journey as a book, the Central Highlands chapter would be the most exciting one. In fact, it was one of the hardest rides to conquer, in which the topography only plays a small role in this challenge, as the real nightmare was the weather. Have you ever imagined experiencing all types of weather, from hot to cold, from windy to rainy in one day? Well, these unexpected factors are what made our trip both memorable and challenging. I chose Da Lat as the starting point of this journey. 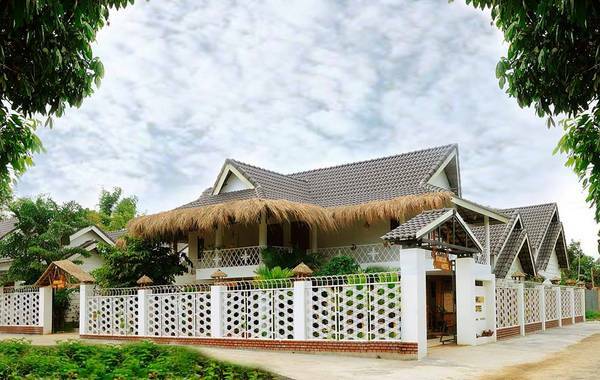 From there, I road to Buon Ma Thuot (staying over for one night), then I made my way to Kon Tum and rested in a beautiful bungalow to prepare for another long trip to Hoi An. The length of this route is around 720 kilometers, which takes approximately 20 hours of travel. Buon Ma Thuot is a city of Dak Lak Province. If you love Vietnamese coffee and love Trung Nguyen Legend drinks, you should write the name of this city on your Vietnam bucket list. Buon Ma Thuot is very well-known for having a Trung Nguyen Coffee Village. To my amazement, this city is more developed than I thought. There are many hotels, cafes, restaurants, and entertaining places around the city. The atmosphere here is also busy but not as crazy as Saigon. There are not many specialty dishes on my must-try list of Buon Ma Thuoc food. Instead, we wandered around the market area to find a variety of good bites. We had a good canh bun – a kind of noodle – at a cart in a smaller alleyway for lunch and broken rice with pork rib on Phan Boi Chau street (near Biti’s showroom). We stayed at Cat Phu Hotel in the city center. The location was perfect! Market, shopping malls, restaurants, and food carts are within walking distance. The room was new and clean. It cost us 200,000 VND/night in a double-bed room. In my opinion, this is the easiest route in the Central Highlands journey. The 210-kilometer long route wouldn’t have been so cool without driving up and down the curvy passes, then going through peaceful paddy fields and chasing the sun as it slowly hid itself in the mountains. Since it will take you around roughly five to six hours of driving, it is better to leave Da Lat early in the morning. You will have two stops for sightseeing and two or three short breaks. We left Da Lat at 10 AM and made our way to Elephant Waterfalls via DT 725 road, which was quite new and smooth. Although it is not a hard road to drive, you should always pay attention, drive slowly, and follow the speed limit. I want to mention this because we had a crash at the first pass, right after we drove past Van Thanh garden, which gave us some bruises and broke the brake of our bike. Luckily, when the accident happened, a couple stopped to offer help. The girl was so sweet to give us tissues to wipe off the blood, while her boyfriend, who happened to be a mechanic, temporarily fixed our bike. We decided to carry on despite not having brakes. Meeting new people is a part of the reason why I love to travel. But back to real life, I am a workaholic who usually spends most of my time working on my laptop. Therefore, I don’t really pay attention to communicating with other people. Going on a trip gives me a reason to step out of my comfort zone. I slowly opened my heart and started talking to everybody that I met on our trip. By chatting with the lady who sells coffee on the street, the children who live in a tiny village, the hostel staff and even other wanderlust souls, I was able to learn more about the culture and custom of these new lands, and discover the history and politics of the area through their point of view. This is especially easy in Vietnam because the Vietnamese people are warm and welcoming. A nice local mechanic who later fixed our bike told his wife to give us a first aid kit and water to wash our wounds and asked us about our journey. He also told us that many people crash on the pass. Fortunately, our injuries weren’t too bad so we could continue the trip. Not only did he fix our bike properly, he also washed it for us. For all of these services, he only charged us 70,000 VND (2.8 USD). We got back on the road and headed to the waterfalls an hour later. 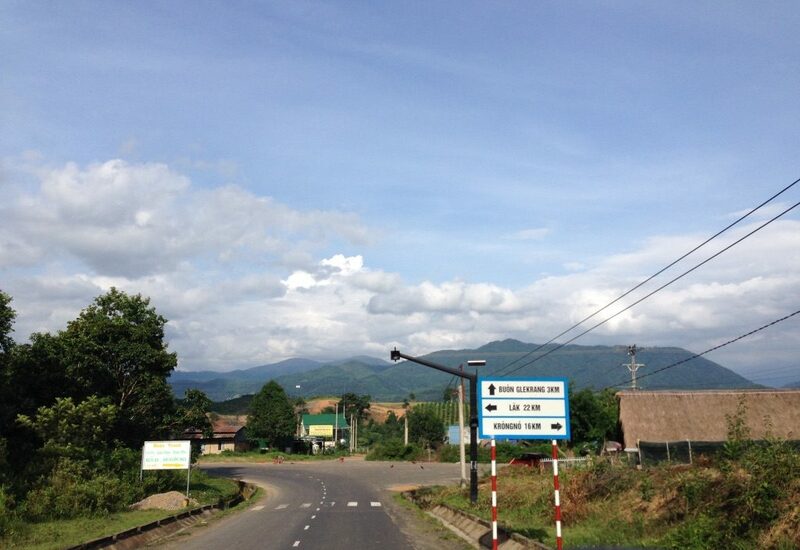 The trip continued on a straightforward road until we saw Nam Ban County Government Office on the left. We took a right at the first junction and drove for around 50 meters, the Elephant Waterfalls was on our left. Google Maps or Maps.me app works really well for finding this area. Red soil is a geographical feature of the Central Highlands. And you’ll know when you cross into Dak Lak province just by looking at the soil. At the beginning of Dak Lak province, we drove on a rocky and dusty red soil road. The temperature was high and the air was dry which made us feel a little tired. The scenery suddenly changed when we entered Lak district. The immense green paddy fields appeared with mountains at the edge of the horizon and the cotton candy clouds were so close that I felt like I could touch them. It was around 4 PM when we arrived. People were preparing to call it a day and going home. The friendly village children waved and smiled at us. They also screamed “Hello” out loud so we could here it. All of them seemed so happy when we waved back at them. On the other side, the farmers were resting after a busy day working. This image reminds me of a lesson that I was taught when I was a kid. In Vietnam, we are taught to treasure each grain of rice so that when we have very few grains in our bowl, we appreciate even just one. It takes a lot of effort to work under the sun and soak in the water almost all day to grow the plant. After harvesting, rice must go through a complicated milling process to turn it into an edible white grain. Therefore, next time when you decide to eat rice, try not to waste it. We soon came across a floating village on Buon Tua Srah hydroelectric reservoir. According to what I know, when the hydropower plant was built, the water filled up Dak Hil stream and turned it into a lake. Where there is a river or stream, there are fish! A long time ago, some villagers from Lak district began catching fish on this lake. Then, to make long-term use of this advantage, they started to think about raising carp fish on the lake. Later, people from many other places relocated to this area to form a floating village and make it one of the main economies of the area. In digging closer to the way everything is run here, I found something interesting. Instead of using commercial fish feed products, the local fisherman feed their fish with smaller organic fish, caught in the wild. Every day, the men of the family go to the lake to catch the small fish in the early morning, while the women handle work on their fish farm. When it comes to harvesting season, they bring fish products (like fresh fish or dried fish) to sell to the vendors. Their customers are villagers from other parts of the area, travelers or the merchants who will bring their products to the market in cities like Buon Ma Thuot. As the rain started to swallow the bridge, we had to speed up in order to cross the final pass before arriving in Buon Ma Thuot city. Because of the accident in the beginning, we didn’t think we could make it to Buon Ma Thuot city in one day. I even had to call the hotel to cancel. That’s why when we arrived Buon Ma Thuot city at 6 PM, we couldn’t help but happily scream out loud. I usually joke that we are all machines running on coffee and we need our fuel every morning. That’s why our first stop was Trung Nguyen Village. For those of you who aren’t familiar with Trung Nguyen, it is a huge Vietnamese coffee brand, which was founded in Buon Ma Thuot in 1996. They own many coffee shops in big cities such as Hanoi and Saigon, but the one in Buon Ma Thuot is the biggest. I asked some locals here about where I should go to have the best coffee and five out of five people told me to head over to Trung Nguyen Village. However, I do not recommend this village to you. 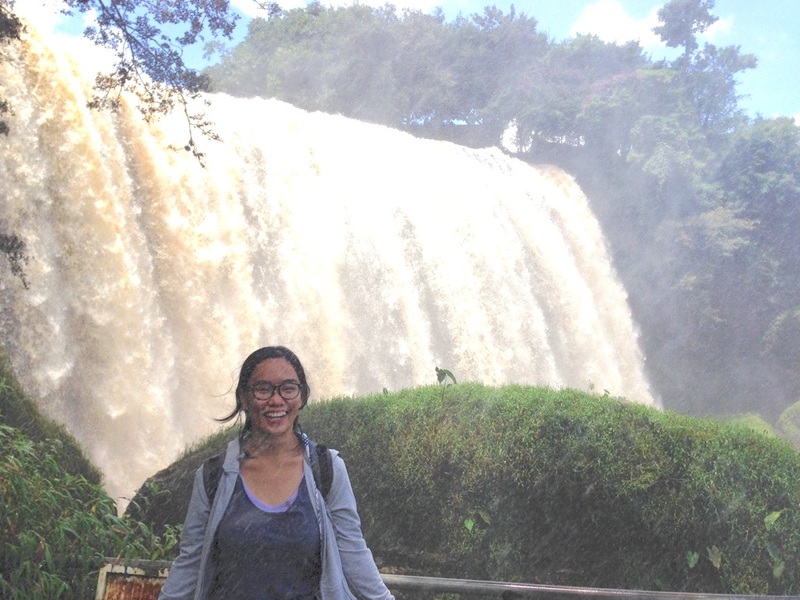 Before leaving Buon Ma Thuot, we still had time to check out Draysap Waterfalls. It’s a majestic waterfall located 30 kilometers away from the center. If you love listening to the songs of the waterfalls and want to stay away from touristic sights, then you should head over here. 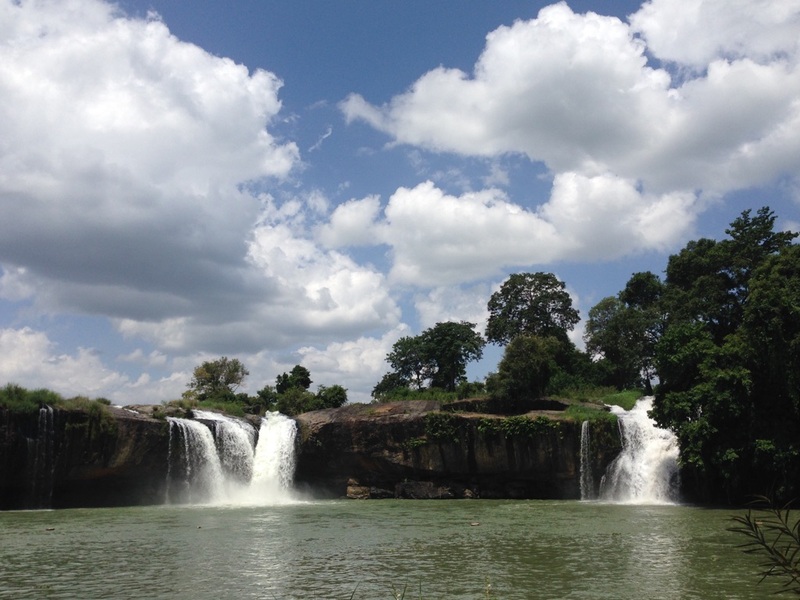 And if you have some free time in Buon Ma Thuot, the top of Dray Sap Waterfalls is a perfect spot for having a picnic. Another waterfall which you can also check out is Dray Nur! Some locals advised us to go there but due to the lack of time, we had to skip it. Kon Tum is located roughly 230 kilometers away from Buon Ma Thuot. This part of Vietnam still has many remnants leftover from when the French were in Vietnam. Many tribal villages also live together in this area. When you are in Kon Tum, don’t forget to visit Kon Klor bridge. It is the biggest and most beautiful suspension bridge of the Central Highlands, crossing the Dak Bla river. If your schedule is not too tight, it will be a fun experience to pay a visit to KonKtu village on the other side of the bridge. It’s the ancient village of Bah Nah people, which still retains its pristine beauty and traditional lifestyle. On the way to Kon Tum, you will pass Gia Lai city. When you are there, don’t forget to find the specialty pho kho and have it for lunch. Coffee in Gia Lai is also delicious and cheap. 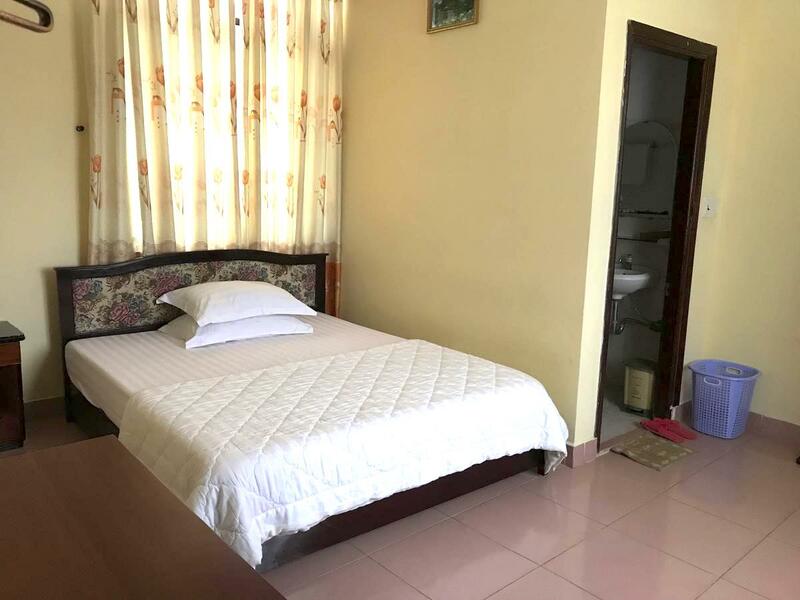 We didn’t expect that a cheap room in Kon Tum could be so wonderful. We had a bungalow with a private path to our room. The room was small but cozy. The AC works well too! When the sun goes down, you can buy a beer in the hotel and walk to Kon Klor bridge nearby to enjoy the magnificent view of the sunset. Plus, the staff was friendly and professional. If you stay here, don’t forget to try the yogurt and banana for breakfast. It’s fresh and tasty. I’m sure you will love it! 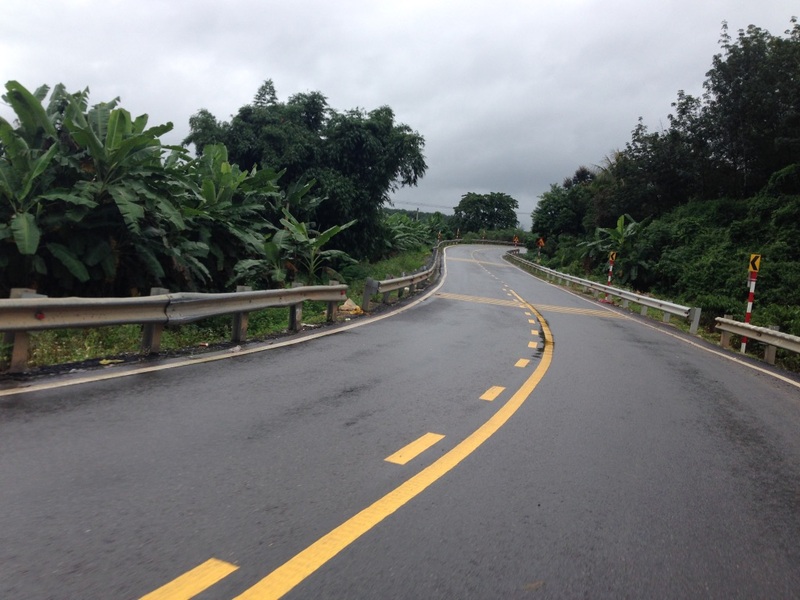 In general, the roads leading to Kon Tum from Buon Ma Thuot are quite nice, except for the weather. There wasn’t any rain but the wind was strong. I like the picturesque landscape of this route. For most of the five-hour ride, we passed under the shade of trees and admired the green color of young rice plants. We traveled through Pleiku on the way to Kon Tum. I was super excited when we drove past Hoang Anh Gia Lai-Arsenal JMG Academy. This is the first professional soccer academy in Vietnam, where many new stars are trained. I secretly wished to join the club when I was a dreamy little girl. We took a break to have some Gia Lai dried noodles at a random vendor. This dish looks like a dried noodle dish from the Mekong Delta (hu tieu My Tho) but the taste is interesting. Once our stomachs were satisfied, we carried on. Even though the trip was short, our bike ran out of fuel when we were only ten kilometers away from Kon Klor hotel. Therefore, my advice to you is to refill your gasoline in Pleiku before continuing on your journey! Our next stop was Hoi An, a unique town belonging to Quang Nam Province. It is hard to imagine that an ancient town, which still retains its original beauty from the past, exists in the center of a fast-developing country. When I wandered around the town, I felt like time had stopped just for me to get a glimpse into the past. 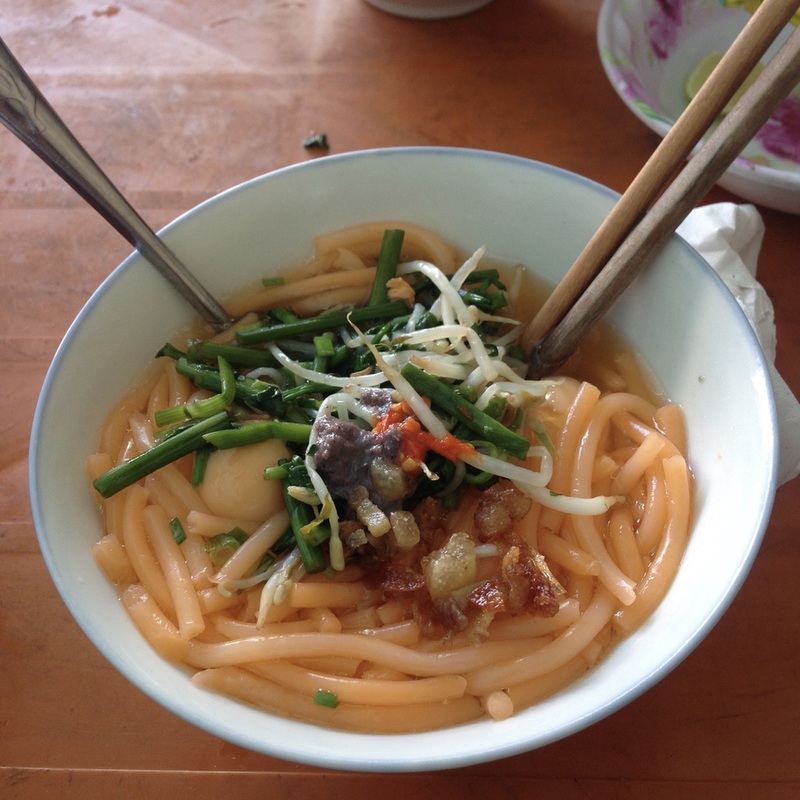 There are a lot of good foods in Hoi An! We ate banh xeo at a local cart on our way. But what you shouldn’t miss when traveling around here are: Quang noodle (mi Quang), cao lau, white rose dumpling, smash cake (banh dap), chicken rice (com ga), banh mi Hoi An, and grilled pork. The warm welcome of Ms. Ngoc from Christina’s Hoi An was a great beginning to our Hoi An adventure. Upon arrival, both of us were super exhausted because of the insane ride. So we took advantage of our time and soaked in the relaxing bathtub then rested our backs on the soft bed. It was great. Another thing I love about Christina’s Hoi An was their amazing pool and bar. It is definitely something I needed after being covered in dust for days. The location is another highlight. Located in Tra Que village, beautiful views of the green fields make this an even more relaxing environment. The seductive An Bang beach is a few steps away from where we stayed. They also provided us with bicycles to tour the town. These little things and the friendly staff are what I call true hospitality! Website: Christinas.vn – Facebook – Airbnb – Tripadvisor. 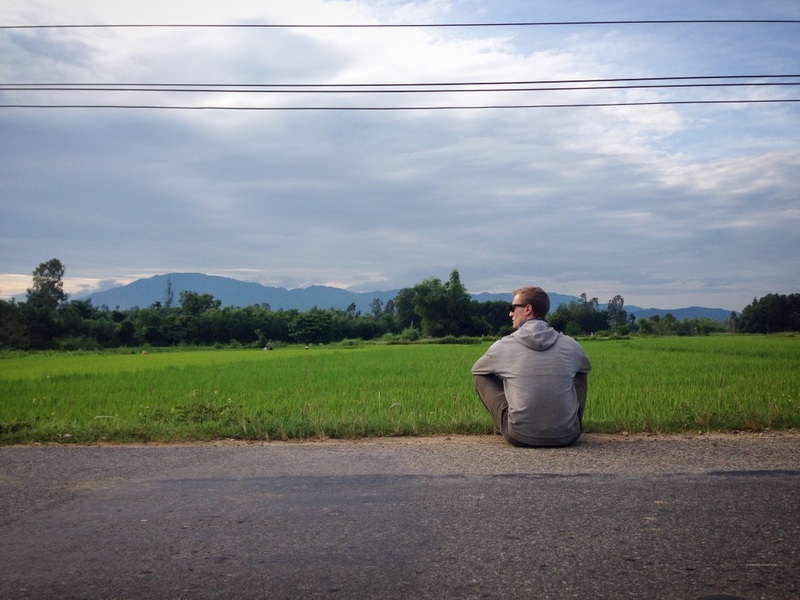 At first, we were about to break this journey into two days: Kon Tum – Kham Duc and Kham Duc – Hoi An. Nevertheless, it was only 2 PM when we arrived in Kham Duc, so we decided not to waste a day in the middle of nowhere and keep driving. We were also very lucky that Christina’s still had an empty room but be sure to check with your own accommodation before you embark. We thought the toughest rides were over when we managed to conquer the route from Buon Ma Thuot to Kon Tum. It turned out it was only a rehearsal for this insane journey from Kon Tum to Hoi An. When the clock struck 9 AM, we departed from Kon Klor hotel and headed straight to Kham Duc, following the Ho Chi Minh trail. The weather was gloomy and it rained periodically which helped cool down the air and led us to predict that the trip would not be too hard until we had to take the first break at Ngoc Hoi. The mountainous atmosphere was cool, the wind pushed the cold through our jacket and shirts, and we could sense it in every inch of our body. It was difficult to control the bike because our hands were so frozen. We paused for a few minutes to warm up. Our trip continued 15 minutes later. We were amazed by what Gaia (or Mother Earth) has given this part of Vietnam. This road traverses jungle and mountain, a truly spectacular feat dreamt up by a mighty mind. When we drove over a bridge crossing over waterfalls and streams, we were awestruck. The water spilled from a rocky cliff, and the pool was so clear we could see the stones lining the bottom. 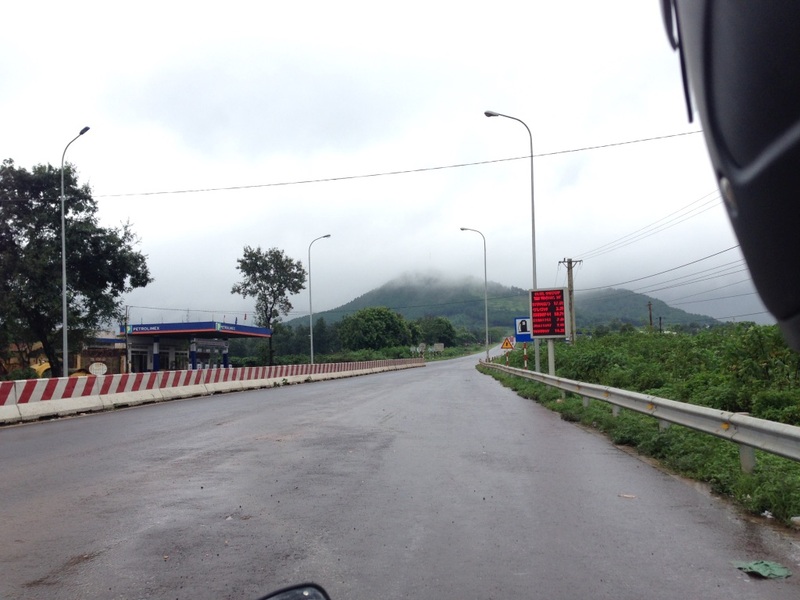 The weather completely changed without giving us any sign once we entered Quang Nam border. From extremely cold, it switched to extremely hot. Our poor bodies couldn’t handle it at first so we had a slight temperature shock. Fortunately, the headache didn’t last long and we finally made it to Phuoc Son Ward, Kham Duc town. 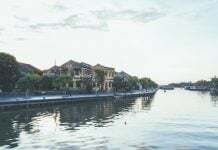 As we arrived earlier than our estimated time and there was nothing to do in the area, we decided to move on to Hoi An instead of wasting a day. This is why it’s good to always be flexible with your journeys in Vietnam. For sunset lovers like us, it was a fantasy dream to witness the sky changing color in the poetic scenery of green fields characteristic of Hoi An. At first, a few rays of orange bled into the blue pastel carpet. The beautiful sky reflected perfectly on the ponds, and we were seduced to stop and stare. Finally, we successfully arrived at Hoi An at exactly 6 PM. When I finally rested in Hoi An, I had time to think about the crazy road we traveled, it still makes me happy to know I conquered yet another part of the Ho Chi Minh trail. I also learned that when we put all of our heart and mind to achieve something, we will receive proportional results. 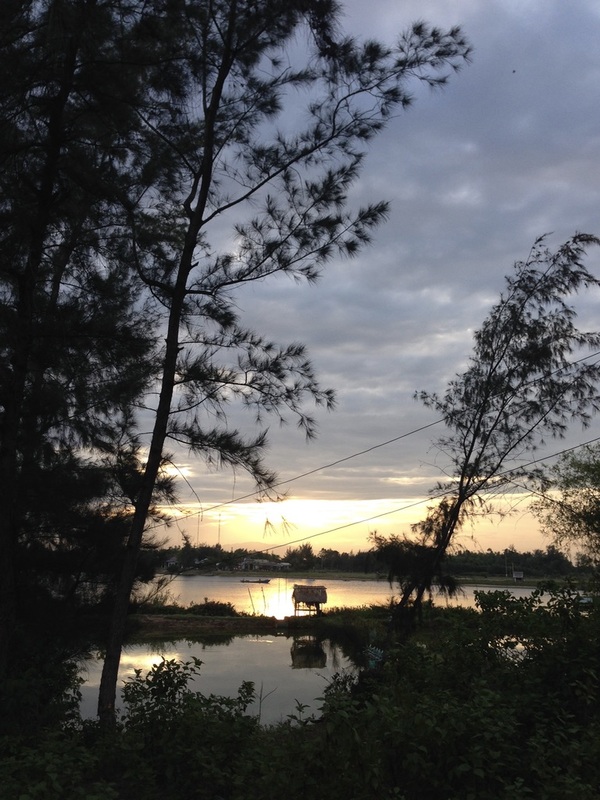 Also, Vietnam on a bike is so different than through the bus window. You need to experience the scenery surrounding you and the locals waving just a few feet away. This adventure will make your Vietnam trip a remarkable one! Hi Eleanor, may I ask during what month were you on this trip? I’m planning the same (Although the other way around, from Danang to HCMC) for this upcoming February. Hope it won’t be too cold? Took you 9h to do Kontum HoiAn, were you riding fast? What type of bike were you riding? We’ll be 2 but each with our own 155cc bike. As the result, we couldn’t really drive fast. We also got lost a bit so the way was even further. We rode a Honda Win. If you have any further question, please let me know. I’d love to share the experience.